Homecoming weekend is always a celebration, but this year, Case Western Reserve had even more to mark: the surpassing of the university’s $1.5 billion capital campaign goal. The announcement came during the Blue Block Party, the official kickoff to homecoming festivities. In addition to the celebration of the nearly 55,000 donors and philanthropic organizations that drove the university past its campaign goal— including a new $20 million commitment for biomedical engineering from Bob Aiken (CIT ’52) and his wife, Brenda—homecoming brought together students, alumni, faculty, staff and families to honor milestones, recognize the accomplishments of alumni and show off their Case Western Reserve pride. Among the weekend’s key events were special events such as the dedication of a Historic Underground Railroad Site marker on campus and the unveiling of portraits for the new “Trailblazer Project” honoring distinguished alumni of color, as well as traditions such as the homecoming parade, Spartan Tailgate and the Stephanie Tubbs Jones Homecoming 5K Race and 1-Mile Fun. During the annual homecoming football game, the Spartans continued their undefeated season (5-0) with a 33-3 win over Bethany College—marking the team’s ninth win of the last 11 homecoming games. Vanitha Raguveer, a biomedical engineering major in the biomaterials track and chemistry and polymer engineering minor. At a luncheon Friday, five alumni were recognized for their outstanding contributions to the university and their respective fields with the 2017 Alumni Association Awards. Then on Saturday, the university showed appreciation for individuals and teams that helped to shape the legacy of athletics at Case Western Reserve through the Spartan Club Hall of Fame inductions. 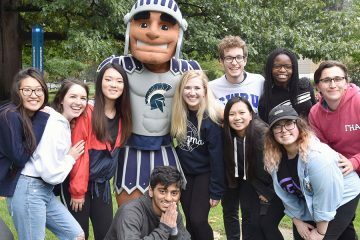 Take a look back at how the university community documented homecoming weekend by checking out #homeCWRUing on social media—and be sure to share your photos too! 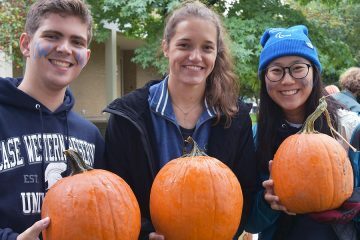 In addition, you can send your homecoming photos to case-daily@case.edu for a chance to have them appear in The Daily.